Backstage Condos, a project by Cityzen Developments, Fernbrook Homes, and Castlepoint Realty Partners Ltd, will soon rise directly behind the Sony Centre at Yonge Street and The Esplanade. Located in a desirable location which provides easy access to both the financial district and the historic St. Lawrence Market, the building will also be connected to a future PATH system and the Union Station. The building will rise 36 stories from a 4-level podium, with retail at street level and on the second floor. Backstage Condos offers 284 units, with 1-BR suites starting at $326,900, 1+Den suites starting at $382,900 and 2-BR suites starting at $514,900. 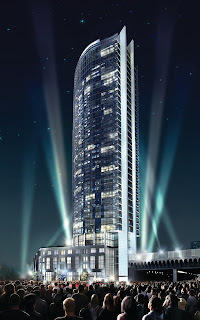 To find out more about the building amenities and see additional renderings, visit the Backstage Condos profile page. Apart from the project itself, the newly completed state-of-the-art sales centre also deserves some spotlight! Situated along Sherbourne just south of Bloor, Times Group’s latest development – the statuesque The 500 Condos + Lofts – is located just steps from the TTC and minutes from Yorkville and the Financial and Entertainment districts. Only a short walk to the University of Toronto and Ryerson University, this development provides all the conveniences of urban living and is ideal for professionals, students and young families alike. The buildings that make up this development at 500 Sherbourne feature a variety of 1, 2 and 3-bedroom condos, towns and lofts. The overall development houses over 360 residential units within three buildings, including a low-rise loft structure for those who prefer a more intimate setting. This week, we're heading north to Markham for a closer look at Reminton Group's Rouge Bijou development, located the new Downtown Markham neighbourhood near Warden and Highway 7. Completed last year, this intimate low-rise development is comprised of four buildings: Rouge Bijou, Rouge Bijou Arbor, Rouge Bijou Promenade and Rouge Bijou Terraces. This luxury condo features exquisitely-appointed suites with soaring ceilings and stainless steel appliances. Providing its residents with the ultimate in comfort and convenience, some of Rouge Bijou's exclusive amenities include a fully-equipped fitness centre, party room and virtual golf. With easy access to both public and highway transportation and extensive plans for the surrounding 243-acre mixed-use development well underway, Rouge Bijou in Downtown Markham is definitely the place to be. In the past 90 days, a total of four units have sold at Rouge Bijou, with prices ranging from $280,000 for a 1+Den to $449,000 for a 2+Den. These properties spent an average of 65 days on the market. A total of 20 units also leased in the past 90 days, ranging from $1,200 for a 1-BR unit to $2,000 for a 2+Den. These rental properties spent an average of 44 days on the market. For more information on Rouge Bijou, please click here.